The coming crisis that affects us all! Baby Boomers, born between 1946 – 1964, are the largest generation ever born, and turning 65 every 8 seconds, 10,000 per day, 4,000,000 per year. In 2030 – there will be over 70,000,000 seniors. The Silver Tsunami is a devastating, world-wide crisis, with a multitude of diseases and costly care… science races to find cures, funding is cut, and an aging population explodes! In her directorial debut – veteran writer/producer Cynthia Harrison, along with writer/producer Brooks Wachtel, peer into the future, and present an ominous portrait of a world unprepared for the coming Baby Boom explosion in SILVER TSUNAMI, a documentary short that features world renowned scientists, medical professionals, and experts focusing on an issue that already affects every country on Earth. Since January, 2011, Boomers have been turning 65 every 8 seconds, 10,000 per day, 4,000,000 per year. In 2030 – there will be over 70,000,000 seniors in the U.S. alone. Well researched and filled with astonishing statistics on our aging world population, SILVER TSUNAMI presents strong, undeniable evidence that the world is on the verge of a devastating epidemic – an epidemic that will impact every facet of society, and test the strength of local and national government infrastructures with a multitude of diseases and costly care. Our fate rests in the hands of these scientists and researchers, as they race to find cures, while funding is cut, and an aging population explodes! It doesn’t appear as a dire headline in the National Inquirer, but the facts are clear – the human race is aging – drastically and dramatically. Thanks to better hygiene and medical science, the world populace is living to unprecedented ages… but with a huge consequence. People are still falling ill and dying of illnesses like Alzheimer’s disease, heart disease, Parkinson’s disease and cancer… in numbers that were unimaginable to previous generations. In fact, for hundreds of years, the life expectancy of an average human being was 25 years. In those days, senior citizens were rare, let alone senior care and senior homes. Fueling the Silver Tsunami is the massive Baby Boomer generation – the largest generation ever born – over 70 million strong in the U.S. alone. That generation – born between 1946 and 1964 – is now aging at an unprecedented rate. But there are already telltale signs of an upcoming catastrophe – people outliving their savings; skyrocketing medical costs; overcrowded senior facilities; and debilitating diseases like Alzheimer’s, cancer and Parkinson’s, that are crippling seniors and their overtaxed caregivers. And the problems aren’t confined to U.S. borders. In many ways, the international community is in more dire straits. In Africa, people between the ages of 30 and 55 have been decimated by the AIDS epidemic, leaving a culture of elderly people over the age of 70, looking after children under the age of 10. In Asia, seniors are respected, but senior care facilities are in short supply. Japan’s birthrate has been declining for years, and seniors will soon dominate that society. We’re just not prepared to deal with what happens over the age of fifty, which is an accumulation of people with chronic disease. Scientists who specialize in aging have been working relentlessly. For the first time in history, we have tools to begin to understand aging at a deeper level, and to imagine interventions. One day soon, we can possibly look at the diseases that come with aging in the way we look at the old, dreaded diseases of childhood – as something that we’ve eradicated with a vaccine or intervention on the process of aging itself. But can we wait that long? The costs of senior care are mind-numbing. Medications…housing…caregivers… Japan is aging so fast, that more diapers are being sold to adults than babies. In the U.S., the expense of treating just one disease – Alzheimer’s – is over $200 billion per year – that will rise to $1 Trillion per year by 2050. That one disease alone could eventually bankrupt the Medicare system. Experts predict that the Silver Tsunami will begin in Asia – where Japan and China already have enormous, aging populations – and spread to Europe and the U.S.
Can the problem be solved in time? The first step is to sound the alarm, and documentaries like SILVER TSUNAMI can lead the way – presenting the facts for all generations to grasp. It is a preventable catastrophe. But if we don’t develop research to address this catastrophe, then the tsunami can sweep over the world and crush everything in its path. I have written and produced many documentary TV shows over the years. When financing came along for me to direct a documentary short film – I wanted to find a subject that I could feel passionate about, and that was also very timely. I had moved up to Marin County a few years ago from LA, and I kept driving past this fascinating and mysterious looking building, high on the hill, just off the freeway. I found out that it was The Buck Institute for Research on Aging. That sounded great – I wondered if I could volunteer for the newest anti-aging beauty treatment, or maybe even get a few samples! Then I took a tour… and I was absolutely amazed by what I found. The facts that I discovered while interviewing these world renowned scientists, and co-writing this documentary with Brooks Wachtel, are scary… and a real wake up call. Baby Boomers are turning 65 at a rate of 10,000 per day, 4,000,000 per year. By 2030, there will be over 70,000,000 seniors in the US alone. Those are huge and frightening numbers. As a baby boomer, I know that I, and many of my friends, are getting older, living longer… but also realizing that the coming years could hold pain and disability. Sure, we work out, try to eat healthy – but close friends are starting to be hit with debilitating diseases, and some are dying way too soon. Listening to friends and family members talk about their struggles in dealing with aging parents, I thought of my own mom and dad, who both died within a few years of each other, after long, terminal illnesses. It was a devastating time for all of us. I look at my teenaged daughter, and worry that one day, she may have to take care of me. I felt a need to do this documentary to sound a warning. People don’t realize the enormous impact of the Silver Tsunami… financially, emotionally, medically… and they must. This is multi-generational – the stress on caregivers is enormous. The cost of treating even one of the major diseases of aging is astronomical, and will grow even more so with the vast numbers of aging boomers. Baby Boomers, born between 1946 – 1964, are the largest generation ever born. They’re turning 65 every 8 seconds, 10,000 per day, 4,000,000 per year. In 2030 – there will be over 70,000,000 seniors. For the first time in history, there will be more people over the age of 65 than under the age of 5. The incidence of Alzheimer’s disease over the age of 85 could be as high as 50%. In 2013, there were 30,000,000 Alzheimer’s cases globally. In 2050, there will be 160,000,000 Alzheimer’s cases. Cures = 0. Over 50% of current retirees have under $25,000 in savings. Brian Kennedy PhD – Current CEO of The Buck Institute for Research on Aging – his innovative work focuses on moving research in aging from simple organisms into mammals, studying pathways that modulate longevity in life forms from yeast to mice. A focus of his current research is to study the target of rapamycin (TOR) pathway, shown recently to extend mouse lifespan, and how it can be regulated to treat diseases of aging. Gordon Lithgow, PhD – Director of the Buck Institute’s Interdisciplinary Research on Geroscience – his ground breaking work sheds light on the mechanisms of aging, by identifying agents to extend lifespan or prevent age-related disease. He has discovered a range of factors that lengthen life in the microscopic worm C. elegans, and applies these findings to studies in human cell cultures to slow aging and extend healthspan. Simon Melov PhD – heads the Buck Institute’s Genomic Core, exploring the role of energy-making units inside cells. His outstanding research helps identify molecular hallmarks of aging to guide the development of anti-aging therapies. The Melov lab looks for broader genetic fingerprints of aging by surveying the patterns of gene activity in various animals, including human beings, mice, and the nematode worm c. elegans. Judith Campisi Ph.D – has received international recognition for breakthroughs in understanding aging as the largest single risk factor for developing diseases. She’s widely recognized for her work on senescent cells — older cells that stopped dividing — and their influence on aging and cancer. She is the recipient of MERIT awards from the National Institute on Aging, Gerontological Society of America, American Federation for Aging Research, and the Longevity prize from the IPSEN Foundation. She serves on numerous national and international advisory boards. Julie Andersen, Ph.D- As a renowned expert on Parkinson’s disease, Dr. Andersen is pursuing a wide array of leads toward treatments for this complex neurodegenerative disorder. The Andersen lab is also involved in identifying potential biomarkers for Parkinson’s that may allow early interventional therapy. Dale Bredesen MD – Founding President and first CEO of The Buck Institute For Research on Aging – Dr. Bredesen’s research has led to new insight that explains the erosion of memory seen in Alzheimer’s disease, and has opened the door to a new therapeutic approach. Kevin Perrott – Researcher, Entrepeneur. Cofounder of SENS Foundation, former Board Member of the Methuselah Foundation. He is Founder and CEO of AgeNet (Aging Research Network), a Canadian charity sponsoring aging research. 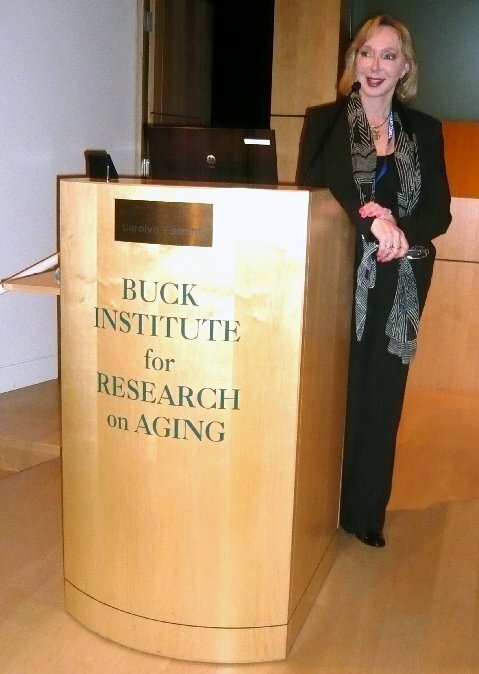 Kevin continues to support the advance of aging research as the VP of the American Aging Association, and through his research at the Buck Institute in Judith Campisi’s lab. Karla Mark – post-doctoral fellow in Gordon Lithgow’s lab. Ken Casey – Mr. Casey is a business entrepreneur, and has consulted with numerous multi-million dollar companies on economic matters. He has spent years studying the coming effects of the Baby Boomers on the economy. The founder of Professional Investors Security Fund, Inc, Ken was a professional soccer player, a member of the 7th team to travel to the North Pole by dogsled, and a world class river rafter. 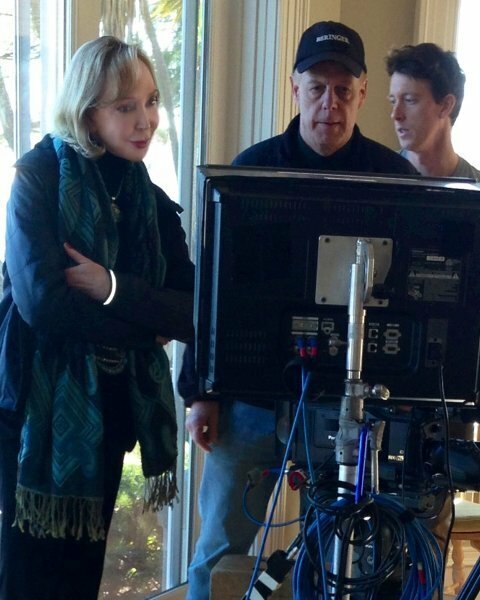 CYNTHIA HARRISON (writer, producer, director) makes her directorial debut on Silver Tsunami. She is an Emmy-nominated TV producer and writer, and winner of the prestigious Cine Golden Eagle award for the History Channel special Fly Fast – the Cutting Edge. A native of Los Angeles, Ms. Harrison has a successful career producing and writing many TV documentaries. She co-created, executive produced, and wrote many episodes of the highly acclaimed History Channel series Dogfights. Among other documentary credits are, The Great Ships, The Royal Navy, Search and Rescue, Defending America – The National Guard and The Coast Guard. She executive produced and co-wrote Rogue Waves,a History Channel tie-in with director Wolfgang Petersen’s feature film Poseidon. In addition to documentaries, Ms. Harrison has written multiple award-winning episodes of children’s programming, ranging from hard action likeSpider-Man, Tutenstein, and Mortal Combat – to comedies such as Pocket Dragons and Horseland – and popular pre-school shows like Clifford the Big Red Dog. Her script for Todd World was nominated for an Emmy Award. Prior to writing, producing, and now directing – Cynthia had a successful career in front of the camera. She started modeling at 14, and continued to model and act while attending UC Berkeley and UCLA. She appeared in numerous magazines, such as Mademoiselle, Glamour and Harpers Bazaar… and fashion shows for designers like Valentino, Ralph Lauren and Donna Karan. She has also done many TV commercials. such as Max Factor, Coke, Static Guard, Lancers Wine and many others. Ms. Harrison is active in numerous charities and non-profits, such as The Marin Museum of the American Indian, The Arthritis Foundation, That Man May See, and many others. She lives with her husband, Lewis, who was a co-producer on Silver Tsunami, and her teenage daughter, Katie, who also appears in the film. Wachtel co-created, executive produced and co-wrote many episodes of the hit series DogFights for the History Channel. He also wrote and produced many History Channel documentaries, including episodes of Defending America: National Guard and The Coast Guard. Additionally, he has written The Great Ships, Search and Rescue, The Royal Navy and Fly Past, which won the coveted Cine Golden Eagle Award.In addition to documentaries, Wachtel has written over 100 episodes of dramatic television – with shows as diverse as Fox’s live-action Young Hercules to animated hits like PBS’ Liberty’s Kids, Tutenstein, Heavy Gear, Spider-Man, X-Men, Robo-Cop, Beast Machines: Transformers and many others. For younger viewers, he has penned episodes of the pre-school hits, Clifford the Big Red Dog and Rainbow Fish. His script for Tutenstein won an Emmy Award. Wachtel has written several live-action features, including Goddess of Death, which he also directed. Other feature credits include Twin Princes, and The White Gauntlet. Wachtel also wrote and co-produced an independent documentary feature illustrating the history of his alma-mater, Hollywood High School. Wachtel serves on the Steering Committee of the Animation Writers Caucus of the Writers Guild, as well as teaches screenwriting at UCLA. He is a performing magician member of Hollywood’s Magic Castle and is currently about to publish his first novel. LOU WIRTH (Editor) brings an exceptional combination of expertise with over 30 years of editing, producing, and directing. His wealth of experience and innovative editing techniques on such shows as VHI’s Behind the Music, and History Channel’s Tactical to Practical, have earned him numerous Emmy Awards and three Telly Awards. RANDALL LOVE (Director of Photography) .has shot over 300 hours of prime time recreations and documentary television for networks like ABC, PBS, BBC, Discovery, History, and many more. His work has been honored with over 100 International awards and he has shot some of the highest rated shows for Nova and National Geographic. NELSON STOLL (Audio sound engineer) has been nominated for 2 Academy Awards for best sound. He has worked on numerous TV shows and over 40 feature films. He recorded the multi-channel effects of the chase scene in the film Matrix 2, and has more recently worked on the highly acclaimed Blue Jasmine and Chasing Mavericks. JOHN A. BELL (Computer Graphics) is an award-winning computer graphics artist. He has produced CG Imagery for TV, film, computer games, muti-media, and print. He provided animation for such films as Exorcist III: Legion, Terminator 2: Judgment Day, and Honey, I Blew Up the Kid, among many others, and numerous TV shows. LEWIS WALLACH (Co-Producer) is the President of Professional Financial Investors, Inc. His educational background includes a Bachelors of Business Administration Degree from Hofstra University in NY. Since 1990, Mr. Wallach has been active in the acquisition, syndication, and financing of numerous real estate projects in Marin County. He brings this business expertise and a unique, creative sense to Silver Tsunami. KATIE HARRISON WALLACH – this young performer is already a show-biz veteran, having done voice-overs for the nationally acclaimed Leap Frogseries, modeling, and commercials, including Toys-R-Us. In addition to acting, Katie has a passion for singing, and plays numerous musical instruments, including acoustic guitar, bass guitar, violin and piano.